71 1933 W.C.T.U. meeting for September was held at the home of Mrs Philllips with Miss Butler presiding after being introduced by Mrs Robt Lincoln. Devotionals by Mrs Herman Prayer by Mrs Hess. Report of Treas. read and accepted. Mrs. R. Lincoln announced that barrel to send to Benedict Home with fruit and clothing is at her home. 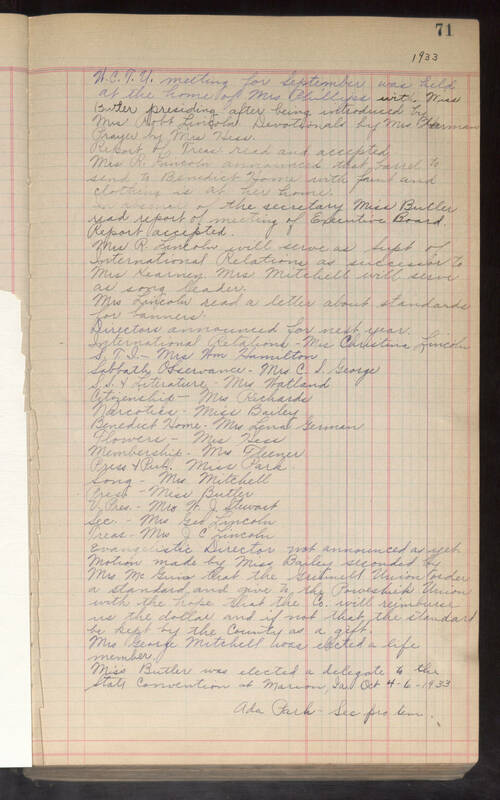 In absence of the secretary Miss Butler read report of meeting of Executive Board. Report accepted. Mrs R. Lincoln will serve as Supt of International Relations as successor to Mrs Kearney. Mrs Mitchell will serve as song leader. Mrs Lincoln read a letter about standards for banners. Directors announced for next year. International Relations-Mrs Christine Lincoln S.T.I.-Mrs Wm Hamilton Sabbath Observance-Mrs C. S. George S.S.I[?] Literature-Mrs Watland Citizenship-Mrs Richards Narcotics-Miss Bailey Benedict Home-Mrs Lena German Flowers-Mrs Hess Membership-Mrs Fluner Press & Pub. Miss Park Song-Mrs Mitchell Pres.-Miss Butler V.Pres.-Mrs W. J. Stewart Sec. - Mrs Geo Lincoln Treas-Mrs J C Lincoln Evangelistic Director not announced as yet. Motion made by Miss Bailey seconded by Mrs McGuins[?] that the Grinnell Union order a standard and give to the Poweshik [?] Union with the hope that the Co. will reimburse us the dollar and if not that the standard be kept by the County as a gift. Mrs George Mitchell was elected a life member. Miss Butler was elected a delegate to the State Convention at Marion, Ia Oct 4-6-1933 Ada Park-Sec pro tem.